Color(s): blue and tan. Yorkshire Terriers are born black, gradually attaining their blue and tan coloration as they mature. The Yorkshire Terrier loves the attention of their owner and love to be kept in their owners lap throughout the day. They show attitude along with an intelligent and jolly character. It is a devoted companion. This breed is brainy, robust and not fearful. Their focus is on their owner and they are very loving. It is believed that Yorkshire Terrier demands much more human company and seek attention than any other breed. They tend to be territorial and want to have their own space. They can bear children if they are treated with care and also get along with other pets. The Yorkshire Terrier tends to be independent and fierce. 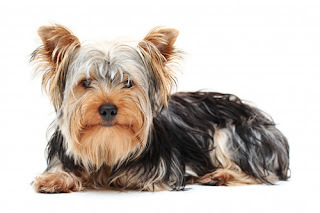 The Yorkshire Terrier’s coat needs grooming on a daily basis. The hair on top of the head must be secured with a bow, or the coat may be clipped short. Moreover ears and eyes must be cleaned everyday to avoid infections and dental hygiene is also necessary. The coat of Yorkshire Terrier is not rough, but in fact soft and silky. The hair of the Yorkshire breed is continuously growing unlike the other breeds which have fur and on top of that they do not shed. Moreover, they have no undercoat. It is an intelligent breed and learns quite easily. However, it can at times become very stubborn and in this case training can prove to be difficult. They need to be showered with praises to bring out the best behavior in them. The Yorkshire Terrier needs limited amount of exercise. They are apt for apartment livings or houses with small yard. They enjoy short walks, chasing shadows, lying in the sunbeams and tug of war.